L.A. Clippers owner Donald Sterling lashes out at Magic Johnson, again. 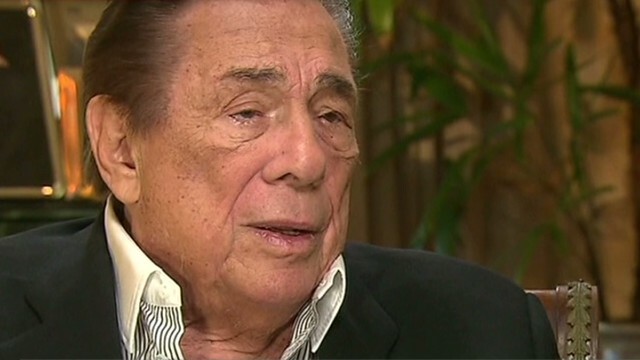 Donald Sterling's mea culpa that wasn't. The VA faces new accusations. And another case of MERS in the U.S.
What has Magic done? Give the man credit for being consistent. The L.A. Clippers owner took a swipe at Magic Johnson in the recording that earned him a lifetime ban from the NBA. Then last night, Donald Sterling really unloaded on the Hall of Fame point guard, entrepreneur and philanthropist during Anderson Cooper's interview, questioning what Johnson had done for the black community. Johnson has a well-established track record of raising millions for charity and bringing businesses to minority areas. Getting the story: It's dangerous work getting a team into the heartland of Boko Haram. The Islamist militant group controls most of the roads across the sprawling area. Still, CNN's Lillian Leposo made it through and found a few brave souls to interview and share the story of what happened the night Boko Haram abducted nearly 300 schoolgirls and the humanity that remains in this outpost that can no longer count on government protection. New accusations: Two Durham VA Medical Center employees have been put on administrative leave because of "inappropriate scheduling practices," the Department of Veteran Affairs said yesterday. The facility in Durham, North Carolina, is at least the fourth hospital accused of manipulating health care appointments. The latest allegation comes as the VA defends itself against claims of potentially deadly delays at other facilities throughout the nation. Case No. 2: Worried yet? The Centers for Disease Control and Prevention says don't be, even though health officials have confirmed a second case of MERS in the United States. Both patients - one in Indiana and another in Florida - had been working in Saudi Arabia. The "risk to the general public remains very low," according to a CDC representative. Fingers crossed. The first confirmed case appeared in 2011. To date, there have been 538 cases in 17 countries, including 145 deaths, according to the World Health Organization. Opponent dies: Former "American Idol" contestant Clay Aiken will advance to the general election after his opponent in the Democratic primary died unexpectedly. Aiken was locked in a close race with 71-year-old businessman Keith Crisco for a North Carolina congressional seat at the time of Crisco's death yesterday. Just 300 votes had separated the candidates. Aiken will face Republican Rep. Renee Ellmers for the seat. - She's just showing off: CrossFitness guru Meghan Umphres Leatherman wasn't going to let a little thing like being nine months pregnant slow her down. She gave birth to a little girl two days after lifting 215 pounds. - No horsing around: Oh, THAT'S why they put the orange warning cone there. - #YoYoBaby: Six-year-old Kazuya Murata of Japan sure knows how to string along his fans. - Poor eye-mouth coordination: Nana the Great Pyrenees is NOT a natural when it comes to catching doggy treats. - No hands, no problem: Ibrahim Hamato of Egypt lost his arms in an accident at age 10, but loved table tennis too much to give it up. VA Scandal: Of course it's all the employees' fault. It's completely irrelevant that the only people who had the authority or ability to orchestrate the situation were at the top. No, a couple of bad apples at the very bottom of the chain of command are entirely to blame. Just like when soldiers at the bottom of the chain of command took it upon themselves to torture prisoners in Abu Ghraib and Guantanamo on the same day, at the same time, on opposite sides of the planet with no coordination whatsoever, even though both teams performed the same tortures and took the same pictures. No, nobody higher up knew anything about it. You do realize that in both cases, there are only two options for senior leadership: They're either lying, or they're clueless and incompetent. There's no way any senior leader here can claim innocence and claim any degree of leadership ability. EL, I agree almost entirely...and though I'm all for acknowledging incompetence in government – The examples you used and the VA tragedy are both more evidence of our leaders lying to us. The worst part is that they think that we're stupid and that we'll just keep believing it. Ibrahim Hamato is an inspiration to anyone facing challenges.Amazing how six year old Kazuya Murata handled his yoyo. What a nice start for my New Day. Sterling interview. I was waiting for bubble to errupt from his mouth since he behaved the clown. Non-apology is correct. Just proved everyone's point.